When my son was little, his grandmother told him to say, “The devil made me do it”, whenever he was in trouble. 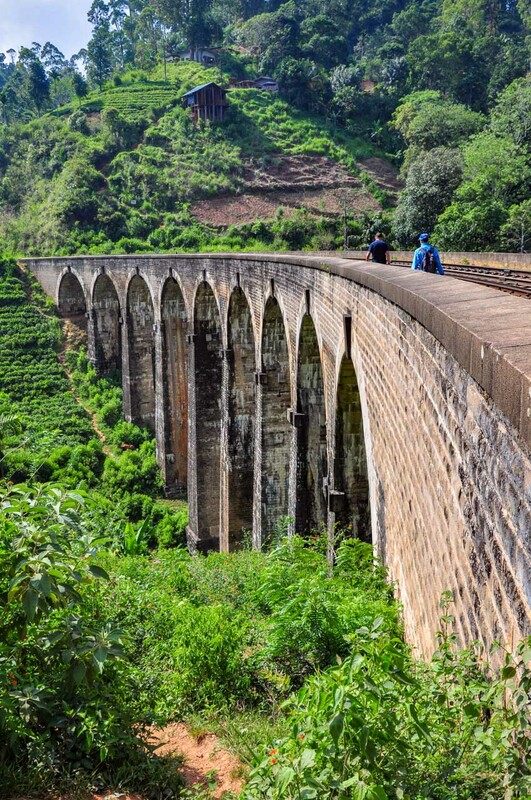 On a recent trip to Sri Lanka with my sister and brother-in-law, my sister decided it would be an adventure to walk the 3 kilometres along the railway line from Ella to the iconic Nine Arch Bridge. 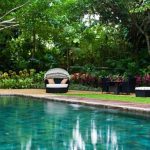 From there we would decide whether to walk back to Ella or continue a further 3.5 kilometres along the railway line to Demodara train station, catching the Kandy-Colombo train back to Ella. 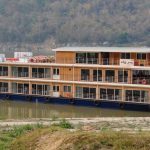 With all in agreement, and knowing the expected time the train departs Demodara, we set off at 8.20am after an early breakfast for our possible 6.5-kilometre walk. 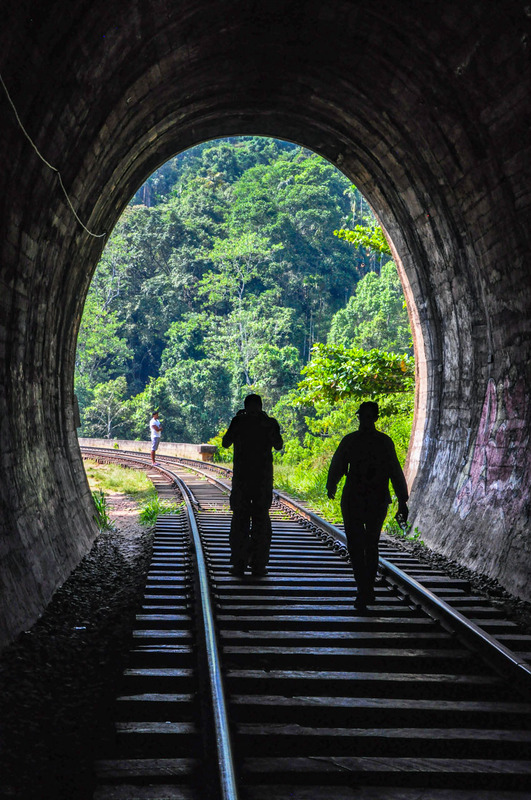 So, you ask, what’s the connection between walking a railway line in the hills of Sri Lanka and a grandmother teaching her grandson how to get out of trouble? Read on and the dots will be connected. I stopped worrying about ending up in a Sri Lankan prison when, about 5 metres further down the line, it became evident the authorities had given up telling people that walking the line is prohibited because there was now a sign advising that walking the railway line is dangerous. I relaxed. ‘Dangerous’ I can handle, but ‘prohibited’ goes against my ‘good girl’ nature. However, ‘dangerous’ became a not-so-friendly companion again upon entering a tunnel that was impossible to see any light coming from the other end. Blindly feeling my way through the tunnel with my feet against the railway track, I wondered aloud what action should be taken in the event of a train coming whilst we are in the tunnel. 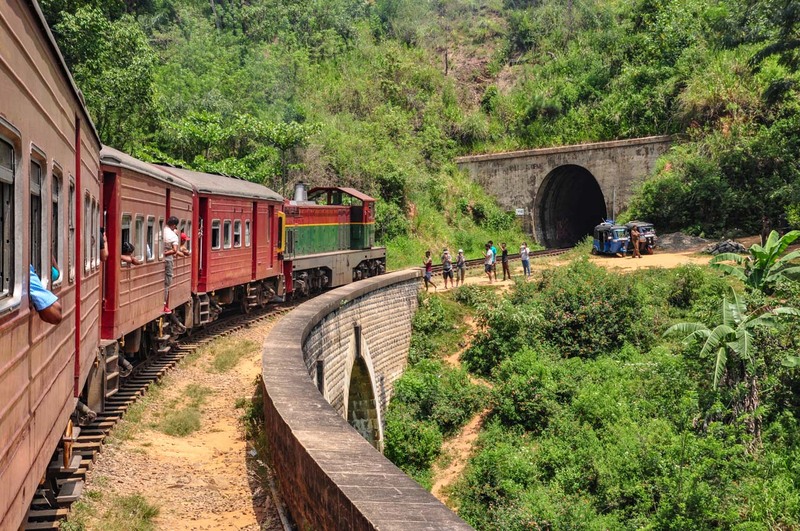 Luckily, my brother-in-law had been thinking ahead and had consulted with the Hotel Manager; finding out what time we might come face-to-face on the Nine Arch Bridge with the train from Kandy. Feeling relatively safe in the knowledge I was not about to be squished by a train, the walk through the tunnel became a devil-may-care adventure filled with excess adrenaline running rampant through my body. I imagined I was breaking new ground, being the first person to walk through a railway tunnel. I may not have felt quite so safe, and would definitely have run out of adrenaline, had I known the tunnel exits right on the Bridge. The Nine Arch Bridge, a popular tourist attraction, spans a deep gorge and is surrounded by a vision of green; of tropical forest interspersed with tea plantations. And so-called because it has nine arches or spans. Very imaginative! At 91.44m (300ft) long, 7.62m (25ft) wide and 24.38m (80ft) high, this railway bridge is deemed to be an engineering marvel as it is made entirely of rocks, bricks and cement without a single piece of steel. Not knowing anything about engineering, I have to concur with the experts. What I do know is that its height and all those arches, plus the environment in which it is erected, make it one pretty and impressive bridge. We had timed our arrival at the Nine Arch Bridge to watch the 9.15am train from Kandy cross the bridge. 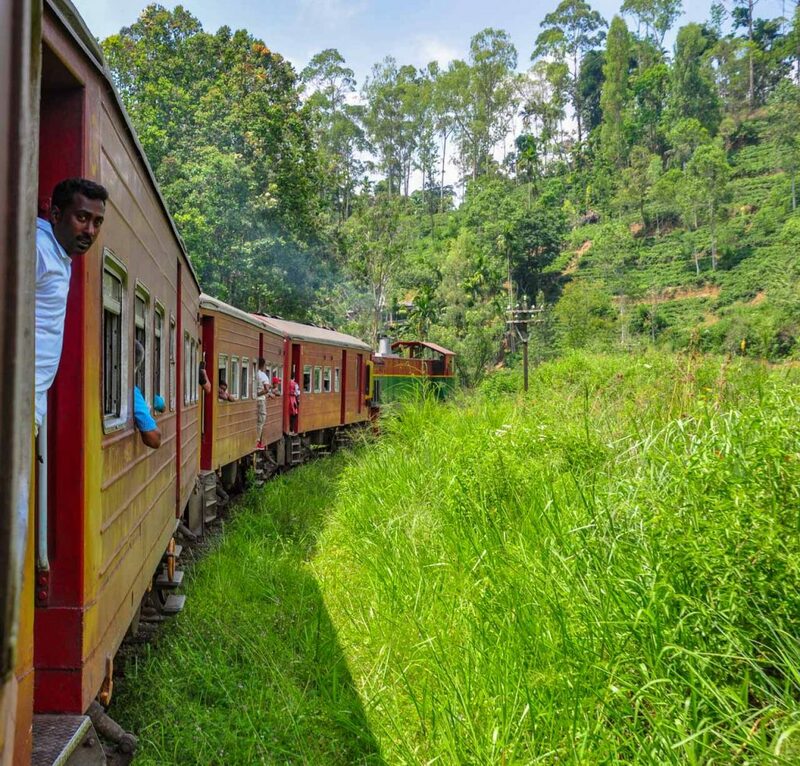 All the information you read about Sri Lankan trains tell you they rarely run on time. However, this one – my thanks to the driver – was on time and came down the line just after we crossed the bridge. Stepping off the tracks, I expressed my thanks with an enthusiastic wave to the driver and all the passengers. I was reliving a childhood experience. Mind you, one that I have never had. I have walked a gas pipeline before but never a railway line and have never been close enough to a train driver in a moving train to wave to him. The Nine Arch Bridge is the midway point between Ella and Demodara stations. 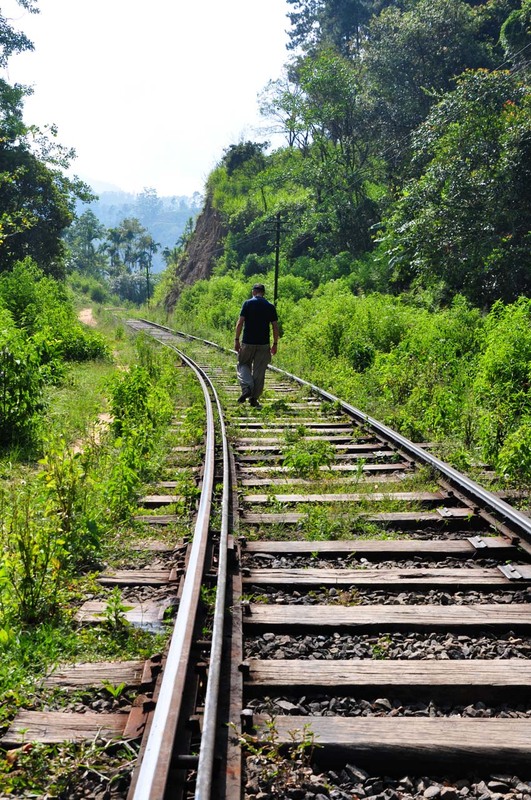 Having got this far, the decision was made to continue our walk along the railway line to Demodara to catch the 10.40am train back to Ella. I was on a mission now to reach Demodara in time to catch that train as I was not walking the 6.5 kms back to Ella. We made it to Demodara by 10.20am but weren’t allowed to purchase our train tickets immediately; being told to wait until 10 minutes before the train is due. No explanation was forthcoming as to why this is so. 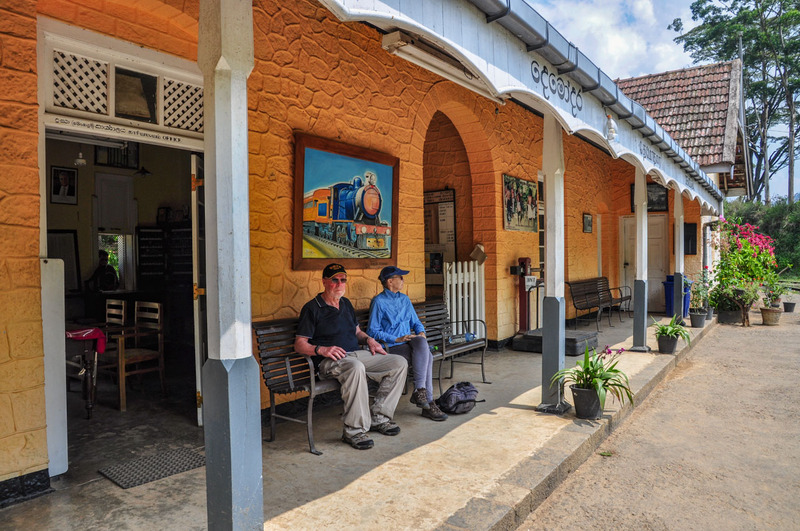 However, Demodara is such a pretty station, with its many potted flowering plants lining the station, we were happy to wait to be ‘allowed’ to buy our train tickets. When I did front up to the ticketing window, I thought I had misheard when asked to pay 30 Sri Lankan rupees (the equivalent of 30 Australian cents) for 3, one-way tickets from Demodara to Ella (10c each). I was so impressed with how cheap it was, I shouted my sister and brother-in-law their tickets. The train was practically empty. Not what I had expected. This made choosing a seat difficult due to having too much choice. Which seat was going to give me the best view of the scenery as it passes by outside the window? In the end, I chose to stand in the doorway like a local. The train ride, although short-lived, was fun and the highlight of my day. Anyone would think I have never ridden a train before! 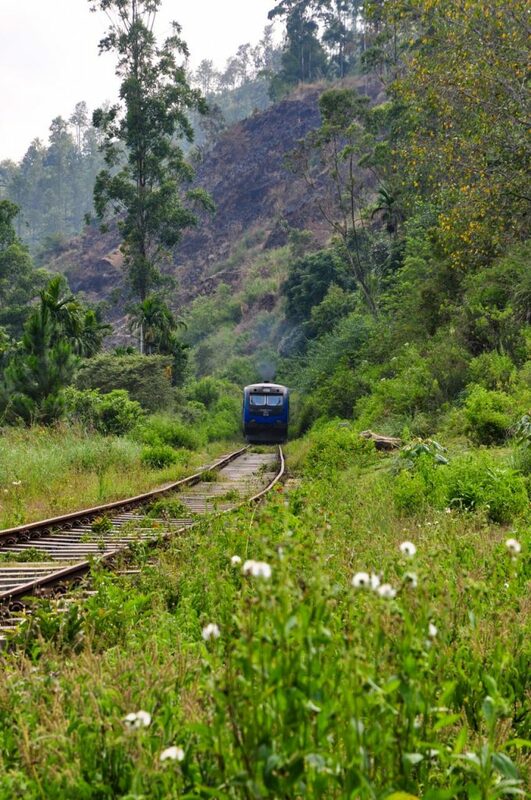 This walk along the railway line is touted by guide books as a ‘must do’ activity when in Ella. However, we came across no other tourists except at the bridge itself. 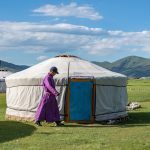 Is it too far off the beaten track for most tourists? We were the only non-locals walking the line. I had to smile whenever we passed a makeshift stall by the side of the rail tracks – they cater for people’s needs wherever they can! The walk had actually been very easy. It was flat all the way and you get into a routine as you lope from sleeper to sleeper. The constant views of tea estates, valleys and mountains made for a very pleasant walk. And the company was good too – not one disagreement! 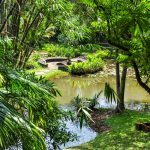 Note: You can get to the Bridge by taking a tuk-tuk from Ella or by walking through the jungle. Or, do as a local does and walk along the railway line.